On the scale of the cosmos, much of our understanding is based on "standard model of cosmology". Informed by Einstein's theory of general relativity, it posits that the most of the mass and energy in the universe is made up of mysterious, invisible substances known as dark matter (making up 80% of the matter in the universe) and dark energy. Over the past few decades, this model has been remarkably successful at explaining a wide range of observations of our universe. 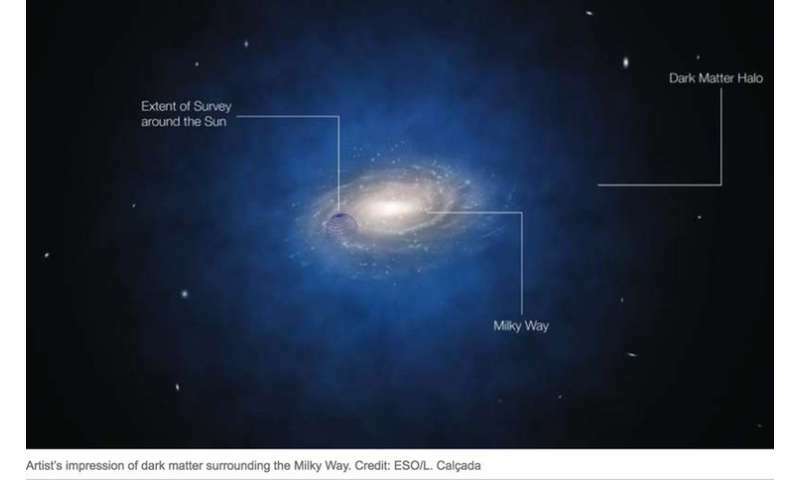 Yet we still don't know what makes up dark matter – we only know it exists because of the gravitational pull it has on galaxy clusters and other structures. A number of particles have been proposed as candidates, but we can't say for sure which one or several particles make up dark matter. The standard model holds that dark matter is "cold". That means it consists of relatively heavy particles that initially had sluggish motions. As a consequence, it is very easy for neighbouring particles to get together to form objects bound by gravity. The model therefore predicts that the universe should be filled with small dark matter "haloes", some of which will merge and form progressively more massive systems – making the cosmos "lumpy". However, it is not impossible that at least some dark matter is "hot". This would comprise relatively light particles that have quite high velocities – meaning the particles could easily escape from dense regions such as galaxies. This would slow the accumulation of new matter and lead to a universe where the formation of structure is suppressed (less lumpy). Neutrinos, which whizz around at extremely high velocities, are a good candidate for hot dark matter. In particular, they do not emit or absorb light – making them appear "dark". It was long assumed that neutrinos, which come in three different species, don't have mass. But experiments have demonstrated that they can change (oscillate) from one species to another. Importantly, scientists have shown that this changing requires them to have mass – making them a legitimate candidate for hot dark matter. Over the past few decades, however, both particle physics experiments and various astrophysical lines of argument have ruled out neutrinos as making up most of the dark matter in the universe. What's more, the standard model assumes that neutrinos (and hot dark matter in general) have so little mass that their contribution to dark matter can be ignored completely (in most cases assumed to be 0%). And, until very recently, this model has reproduced a wide variety of cosmological observations quite well. In the past few years, the quantity and quality of cosmological observations has shot up enormously. One of the most prominent examples of this has been the emergence of "gravitational lensing observations". General relativity tells us that matter curves spacetime so that light from distant galaxies can be deflected by massive objects that lie between us and the galaxies. Astronomers can measure such deflection to estimate the growth of structure (the "lumpiness") in the universe over cosmic time. However, making comparisons between the standard model and the new data sets may not be as straightforward as first thought. In particular, researchers have shown that the apparent lumpiness of the universe is not just affected by dark matter, but also by complex processes that affect normal matter (protons and neutrons). Previous comparisons assumed that normal matter, which "feels" both gravity and pressure forces, is distributed like dark matter, which only feels gravity. We looked at the effects of neutrinos and their motions in great detail. As expected, when neutrinos were included in the model, the structure formation in the cosmos was washed out, making the universe less lumpy. 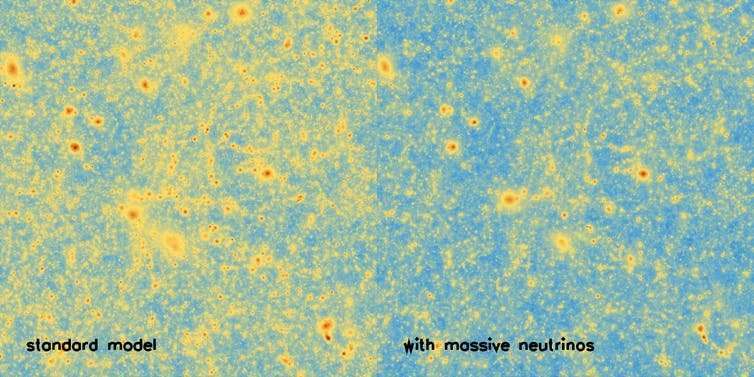 Our results suggest that neutrinos make up between 3% and 5% of the total dark matter mass. This is sufficient to consistently reproduce a wide variety of observations – including the new gravitational lensing measurements. If a larger fraction of the dark matter is "hot", the growth of structure in the universe is suppressed too much. Matter and darkmatter are identical in structure, protons, neutrons, gravity and electromagnetism. So now darkmatter exhibits the same identical gravity as matter, emits the same neutrino's as matter, protons through the internal quarks in atomic reactions emit neutrinos so darkmatter has the same identical protons as matter emitting the same identical neutrinos as matter. 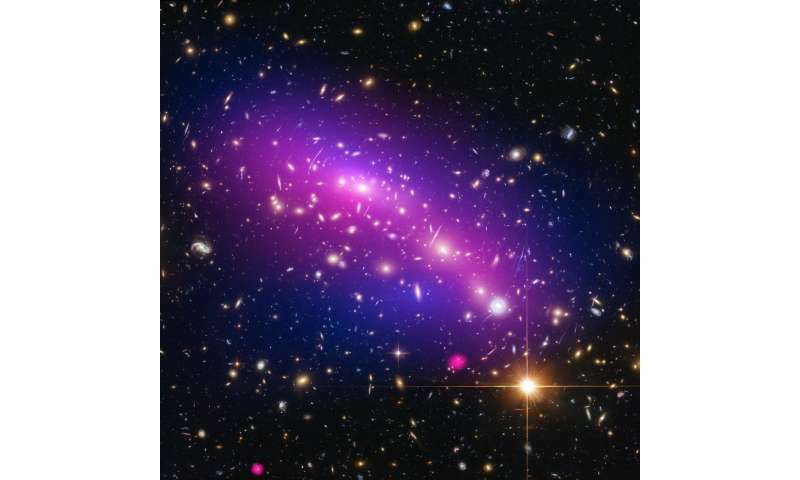 I'm curios does darkmatter have anything in its structure that is not identical to matter. Beyond the small difficulty that we can, as yet, only infer its existence ?? @Nik_2213: Please provide an example of something -- at any scale -- that is percieved directly. I'll give one: the ego, or self. Now you. Ever seen an electron? Know of anybody who has? Do you think it exists? Very, very interesting. So now there is a (very small, but significant in structural terms) challenge to the "pure" ΛCDM model. It's not going to overturn it, but it definitely will modify it if it pans out. If the mass contribution of the neutrinos were higher, we might start arguing about MACHOs and dwarf stars and black holes and stuff, but there's still 95% of dark matter to account for and they still can't do that. a few more articles like these, If the mass contribution of the neutrinos were higher matter content would account. That Neutrinos should be considered in DM is not new although I admit it isn't 'old' news either. It is only very recently that N's possess various 'properties' which been calculated and we are still learning about these elusive particles. Although their mass is very small compared to other st.m particles their large numbers would have some gravitational effect. Imho this article is another step in the right direction to further our knowledge of N's even if they are found to be only a small constituent of DM. Neutrinos could be an interesting avenue, in that we only really (partially) understand them as they appear in our own neighbourhood, with our local star their main source. Who knows... other types of star may produce different 'species' of neutrinos, beyond the three kinds we are familiar with? Could it be that other kinds of cosmic objects also contribute neutrino-like particles into the mix - perhaps with differing properties and characteristics not easily detected from our earthly location, due to the protective cocoon our sun maintains around the planets? At galactic scales, do neutrinos form a diffuse haze? Can they clump together to form larger structures? Or do they stream forever outwards away from their point of origin? Interesting possibilities from a particle family we already know exists - and in volume - yet which we don't yet fully understand. Some neutrinos are formed in weak interactions like beta decay. (A nucleus emits an electron and antineutrino to form a new element. The energy of the antineutrino can be extremely small.) But I suspect that cosmologists models don't include reactions like a neutrino and a proton interact to form a neutron and an electron. This requires a very massive (high-energy) neutrino or a photon to provide the missing energy. In the first second after the big bang, such reactions will actually cool down the neutrinos before inflation, which will cool them a lot more. Also inflation will tend to "freeze" the lumpiness of the universe. The cooling effect will take particles travelling near the speed of light down to much lower speeds. And of course, inflation itself will cause regions of space to lose communication with each other. This contact may be regained, hundreds or billions of years later, but will pretty much be limited to photons and hot neutrinos. Hmmmm, @eachus, the problem with the inflation-after scenarios is accounting for the inflaton. In the inflation-before scenarios it is naturally accounted for by cosmological constant of a high value in the initial vacuum fluctuation. This high value of CC is unstable and decays, dumping its energy into the nascent universe and creating the Big Bang after the inflation is over. On the other hand, I'm not sure how this affects your neutrino analysis. Do you think it does? Oh, and that inflation drastically cools the universe through expansion. That's almost more religion than science. Then all you need is the right timing, so that inflation kicks in when early neutrinos have lost most of their energy through particle interactions. Notice that neutrinos don't interact with photons. Or you could just have some magic like the neutrinos splitting with each inflation doubling. Maybe somewhere in brane theory there is something like that. I just had an interesting thought while making the previous post. Let's put a SMBH in the center of a galaxy cluster level field of neutrinos. How many neutrinos fall into the black hole? Not many. There is no way for them to radiate energy. Now put an accretion disk around the black hole. Neutrinos can now interact with the electrons in the accretion disk, and lose some momentum with respect to the black hole. (Specifically neutrinos and electrons interacting elastically.) But the electron and neutrino have a momentum vector pointing away from the black hole. The extra-galactic neutrino may now be trapped into a highly-elliptical orbit. Interaction with (electrons) in the galaxy will tend to flatten that orbit. Eventually, the neutrino will end up in an orbit well outside the core of the galaxy. Just some material for thought. I'll have to think about that stuff a little while, @eachus, but I've bookmarked this thread. I'll be back hopefully later this evening or tomorrow morning. Right off the top of my head it seems to me that the first thing required is a lot more neutrinos than we see. Maybe I am misunderstanding your approach here but I understood that the problem with neutrinos was the lack of interaction? Neutrinos do not apparently interact via electromagnetism or as far as anyone knows, by the strong nuclear force. They do participate in the weak force. If you draw a Feynman diagram for a neutron decaying, you get one particle decaying into three: Proton, electron, and anti-neutrino. Switch it around, and you have a proton and electron colliding, producing a neutron, and a neutrino. Or other interactions, some of which consume a neutrino or antineutrino. Stick with at most two inputs for now. So neutrinos do interact, but no known interactions involve photons. For a very brief period after the big bang electrons and neutrinos will have huge momentum, mass, and cross-section. In theory a neutrino and electron with enough energy can collide and create two mesons or bosons (one an antiparticle). These can decay giving off photons. The point is that if you have enough neutrinos at the big bang. They will contribute to cooling the matter present. Even if the neutrinos are still warm dark matter, the extra cooling they contribute before inflation may still leave a sufficiently lumpy universe. However, are we not talking here about (free?) neutrinos that are produced in reactions but then escape, hence the large numbers that that show little interaction with normal matter? I can see your point about neutrino capture about an accretion disk and thus take part in interactions there. But if there were a BH+plus neutrinos wouldn't we recognize the BH effects on DM? One of the (fun) things about Feynman diagrams is the way you can flip them around. They assume no symmetry breaking, but symmetry breaking is probabilistic. In particular time-invariance holds. If electrons and anti-neutrinos are produced in a neutron decay, sufficiently energetic anti-neutrinos and protons can produce a neutron and a positron. Notice, no photons. Neutrinos and anti-neutrinos can participate in other less energetic reactions. But if there were a BH+plus neutrinos wouldn't we recognize the BH effects on DM? @eachus Thanks for the reply. Quite agree, not enough info at present. I am aware that among various possibilities two BH's at a center core could merge and then be ejected at high v leaving stars to move outward. But this also makes me ask if we might see some kind of 'trail' produced by the ejected BH as it/they traveled outward? That 'trail might be more detectable if the ejection took place through dense star regions...I'm guessing here and not really making any suggestions. Thanks for the chat anyway. Have a good day. Neutrinos are the aether, the medium that EM theory requires. Do BH emit neutrinos from normal matter?